1. What is the SEC Network? 2. Where can I find the SEC Network channel on TV? Use the SEC Network Channel Finder. You can also watch online, on this website and WatchESPN apps. 3. What is the difference between SEC Network, SEC Network + and SEC Network Alternate Channel? SEC Network is a live 24-hour television network. SEC Network Alternate is an additional television channel. It is not live 24-hours a day. Content only appears on the channel on occasion when games overlap. SEC Network + provides hundreds of additional digital only events to fans through the WatchESPN app on smartphones, computers, and tablets, Amazon Fire TV and Fire TV Stick, Apple TV, Chromecast, Roku, Xbox 360 and Xbox One. SEC Network + is not a television channel. 4. Is the second SEC Network channel I see on my TV guide SEC Network+ ? No. The additional SEC Network channel you see on your digital TV guide is the SEC Network Alternate channel. It is live only on occasion and used when live events overlap. Everything that airs on SEC Network and the SEC Network Alternate channel is also available on WatchESPN. 5. I can't find the SEC Network Alternate channel. The SEC Network Alternate channel may or may not be adjacent to SEC Network in your channel guide. 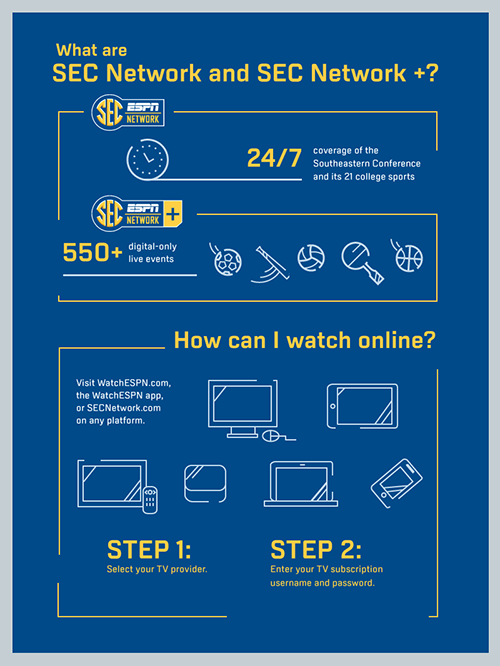 Use the SEC Network Channel Finder, or call your cable provider. 6. Can I watch SEC Network + on my television? SEC Network + events are digitally exclusive events available on the WatchESPN app. SEC Network + is not a television channel, however, you can watch the events on a television screen through the following applications: Amazon Fire TV and Fire TV Stick, Apple TV, Chromecast, Roku, Xbox 360 and Xbox One. 7. Who has access to SEC Network+ ? SEC Network subscribers of AT&T U-verse, Charter, Comcast, Cox, DIRECTV, DISH, Google Fiber, Suddenlink, and members of the NCTC, NRTC and NTTC have authenticated access to SEC Network +. 8. Am I able to watch the network on my mobile phone or similar device? Yes, the SEC Network is available on SECNetwork.com and on iOS, Android, Apple TV and Roku devices through participating providers via WatchESPN. 9. Where can I apply for a job at SEC Network? 10. How many live events will be on the SEC Network? More than 1,000 live events will be available in the first full year across the television network and its digital extensions. 11. What happens if my carrier doesn't offer the network? We encourage you to keep calling your cable, satellite or telco provider to request the SEC Network or switch to one of the many carriers that do carry SEC Network. 12. Can I pay to subscribe to the network online, Pay-Per-View or via ESPN3 if I can't get it on TV? No. However, with a cable or satellite subscription you can access the network on a variety of devices and platforms including Amazon Fire TV and Fire TV Stick, Apple TV, Chromecast, Roku, Xbox 360 and Xbox One. 13. How can I get the SEC Network? SEC Network is distributed nationally as well as in the SEC footprint with providers large and small. You should have multiple provider options in your area. A list of current providers can be viewed on getsecnetwork.com. 14. I live outside the country, is SEC Network available internationally? Yes, SEC Network is available internationally. It is available in more than 50 countries and territories in Europe, Middle East and Africa (EMEA) region via ESPN Player. For information, including a list of countries where the service is available, please visit: www.espnplayer.com. 15. How can I embed an SEC Network video on my website? a. 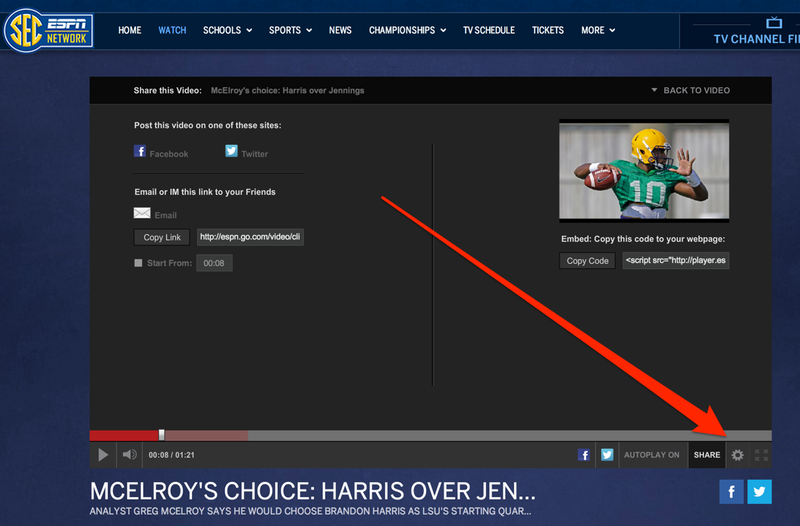 Locate the video you want on the SECNetwork.com website. b. Click the 'Tool' icon below the video, then click "Share". Make sure to wait until the ad ends. c. Grab the embed code, paste it into your content management system or provide it to your website's engineer. For additional media questions please visit www.espnmediazone.com.